I spent a few years as the oldest of three children with a widowed mother. Then I spent many more years as a middle child when mom married a widower with two of his own. The oldest of those two became the oldest of all us kids and there were many nights when I woke up with a bloody nose or scared or sick, that I knocked on her door and pushed her into the mom role. I’m still not sure why us younger kids woke her rather than mom or dad, but we did. Yesterday I called and got her answering machine and her message began the expected way,’hello, this is…’ but after she said the name I know her by, she continued with her full formal name that some call her, and then followed that with sister, mom, and all the labels for the various roles she has had in life. I loved that message. And it made me think of those roles, those labels, the parts we play in life. I wondered if those labels ever fully define us. I’m not sure they can because each is simply a piece of us, obviously. And that, of course, eventually led to writing, as most of my mental meanderings do. I wondered if this could be a tool for avoiding cardboard characters. If I think of every label my character could live under, each role that is played depending on the person applying the label, then I believe I would have a fully fleshed character. Because that character is going to react differently depending on the label applied at that moment. Plus, with each label comes conflicts, multiple backstories, dreams, hopes, happiness…think about it. I’m going to have a completely different set of tensions and conflicts as mother, wife, sister, and even dog owner. Each separate set of conflicts meshes to create me, but I react differently to stress as a mother than stress as a dog owner. So, not to belabor the point as it’s obvious I’m sure, but I think for future stories I’ll keep this in my writer’s toolbox as one more way to help create real, believable, fully developed people. And then I think I’m going to give my sister another call. LOVE the photo Lisa. Holly looks so different. I almost didn’t recognise her….Special occasion? Benton’s wedding. We did a french roll with her hair and some people thought she looked like Sarah Palin. She wasn’t too happy about that! How brave of you to put that picture up!!! I am proud of you!!! I’m putting this in my toolbox, too. Thanks! And such a beautiful photo, it’s like I can see the love. 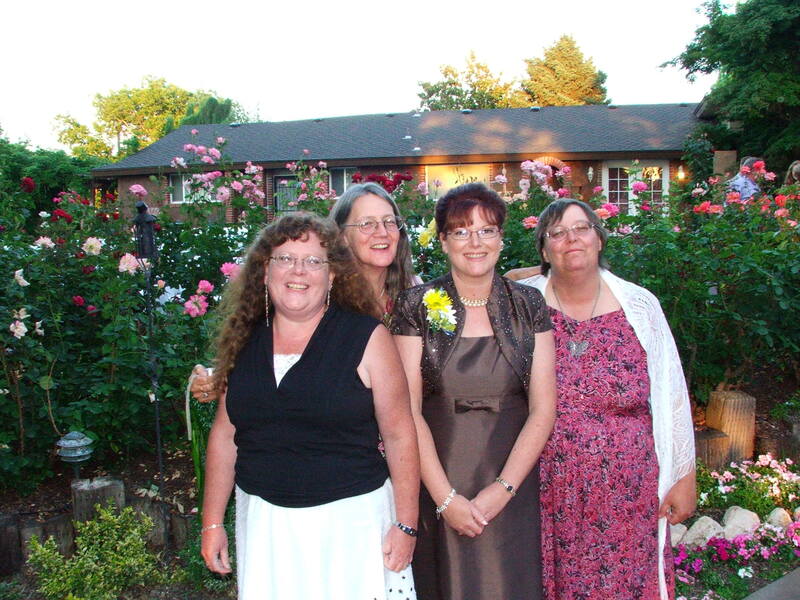 I don’t normally allow photos of myself to exist, but this was the only one with all the sisters. I tried finding one with just the three but couldn’t. Now I need one with the brother, too. I have a habit of gravitating toward caricature, so what you write resonates. When someone sees more than one of your facets, you know you’re being fully seen. Oh, I like that thought, that we are fully seen. Since posting this last night I was thinking about the protagonist in a story I’m working on and I realized that right now she basically has two labels/roles. But she is also just stepping out into life and so the lack of roles matches her. And that made me realize that those labels accumulate as we grow, and so the taking on of more roles can also be a tool to show character growth. I think about this a lot too, not just for stories but life in general. One of my favorite things in a book is when the author manages to show me the character in two or more of her roles, with the difference between them obvious. Now that would be challenging, Lisa. To show the difference in how a character talks, acts, etc., depending on the label.